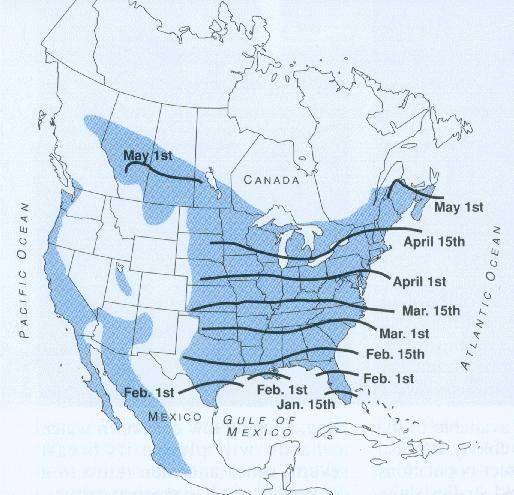 North America is blessed with a large number of different swallow species and some form of them can be found just about everywhere.. Of these, the Purple Martin is the largest member. Within the martin family of North America, there are three distinctly different subspecies, each having their own unique nesting habits. In the Pacific Northwest can be found the Progne subis arboricola. These birds once used the natural cavities in trees in which to nest in the wild, but are now beginning to use individual nesting boxes placed on poles by man. The transition is slow, but little by little, this species is beginning to seek these boxes out at nesting time. In the Desert Southwest, Progne subis hesperia still uses natural nesting sites such as holes in cacti. They have yet to make the transition over to man made nesting boxes. And finally for us here in the Eastern half of the U. S., there's our very own, Progne subis subis. This species encompasses the entire eastern U.S. ranging from the Florida Keys all the way northward into parts of Canada. This species has almost totally developed a dependence on man to supply them housing in which to nest. In general, it will be this species that this page is devoted to. The mature male Purple Martin is a beautiful bird, easily recognizable, fully cloaked in black feathers. His back, neck and chest feathers have a steel blue iridescence which can look purple when sitting in the proper light. The tail and wing feathers are duller in coloring and do not have this iridescence. Only the mature males have all black feathers over their entire bodies. Immature males do not attain the full black body dress until they are in their second breeding year. The females do not have entire bodies of black and never attain this solid black look. Instead, they are much duller than the males and always have a grayish mottled belly. See the photo series below for a clearer understanding of the plumage of these birds. 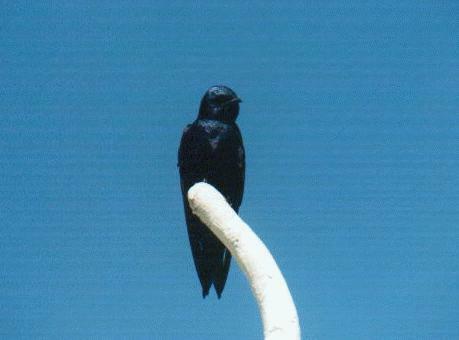 Purple Martins are the largest member of the swallow family with mature birds measuring up to 8 inches long. Most of this length is due to their extremely well developed wings, the tips of which often reach beyond the ends of their tails. They are master fliers which probably accounts for their superb wing development. They have a short, flat, triangular shaped bill which is ideal for catching insects while on the wing. As with most birds in nature, the males are the ones with the brighter colors. Adult males, are a very dark steel blue to almost black. The reflection of the sun off their dark plumage gives off a purplish hue, thus the name "purple" martin. Males do not achieve their full dark coloration until after their second year. The females also have dark backs but don't have the black bellies like the mature males. Their undersides are of a mottled gray appearance. Fledglings and first year males have a similar appearance as the females. 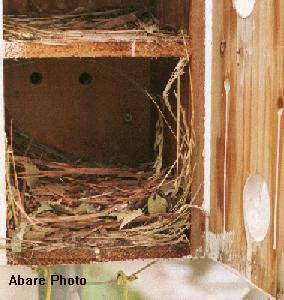 Martins are gregarious in nature and prefer to nest in 'condo' units. These supplied houses usually have more than 6 individual cavities to start with and often have as many as 20 or even 30 cavities in each house. Although it's sometimes difficult to get a colony started, once established, the colony will grow year after year as long as there are nests available to them. Colonies of 300 nesting pairs are not unheard of, although the norm is more like 6 to 10 nesting pairs in the average established site. Martins usually build a haphazard nest using sticks, twigs, bits of straw, pine needles, leaves or whatever's available. 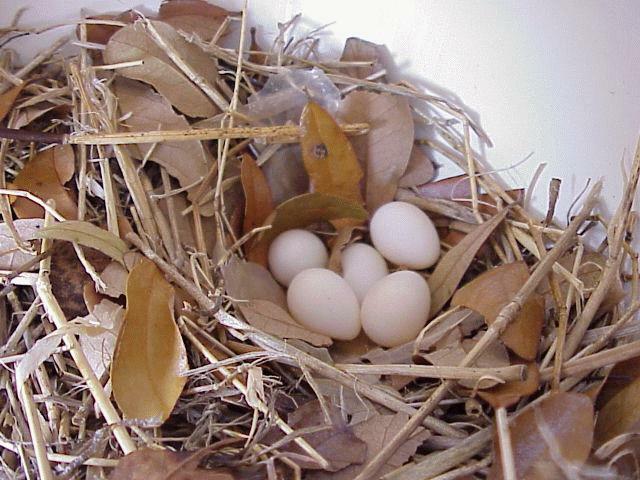 In the back of the nest they form a bowl and lay from 3 to 7 soft white eggs with the norm being 4 or 6. Immature birds usually lay from 2 to 5 eggs while the more mature birds usually lay from 4 to 7. One thing of note, in the smaller cavities, martins often use mud to make a dam just inside the entrance hole. It is not readily known why they build these mud dams, but it's thought they might be for protection, either from enemies or to keep the elements out. These mud dams are usually not present in larger cavities where there is ample room. Incubation lasts from 15 to 17 days, with the female doing most if not all the work. 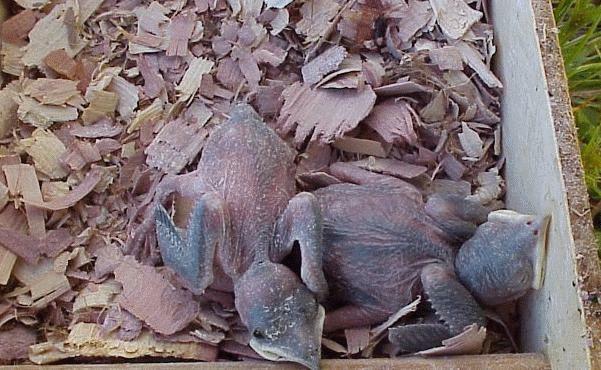 The young are born without feathers and take about 28 days to fledge, or leave the nest. The young may return to the nest for a few nights, after which they will start spending their time with the adults. The adults will continue to feed the young until they have acquired enough skill to catch their own food. Martins are cavity nesting birds. In the wild they search out nesting sites in holes of trees, cliffs and man made structures. Over the years man has learned to provides nesting sites for them and the martins use these houses to raise their young. Likewise, martins have learned through what is called 'generational imprinting', to seek out these man made structures. In the Eastern U.S., martins almost exclusively use man made housing. Martins have a very strong "site tenacity" and if are successful in raising a brood, will often return to the same site to nest year after year. As stated, their nests usually consist of mud, sticks, grass and straw, topped off with green leaves as a trimming. These green leaves are added periodically, although the reason why is not fully understood. It is thought that these leaves are used to keep the eggs moist during brooding. For the most part, insects make up the majority of the martins diet. They often can be seen on early morning and late afternoon thermals, dipping and diving, snatching insects out of the air. Insects on the menu are ants, beetles, butterflies, damselflies, dragonflies, mayflies, moths, stinkbugs, wasps, a few houseflies and maybe one or two mosquitoes. Out of all of these, their favorite food is probably the dragonfly. During year end nest cleaning, the compartments are littered with dragonfly wings and skeleton parts. One myth about martins is that they consume thousands of mosquitoes each day. Not true according to studies done on the diets of martins. Mosquitoes make up less than 3% of the martins diet. If you stop and use a little common sense, this can be figured out on your own. Martins feed high in the air, sometimes as high as 300 or 400 feet, while at the same time, mosquitoes usually stay within 15 to 20 feet of the ground where it's moist, therefore, the two seldom cross paths. Now, if a mosquito happens to be in the path of a martin, the martin will take it, but I doubt the martin will go looking exclusively for them. And besides, the amount of energy spent in gathering mosquitoes would far out way the nutritional benefits and also, if you stop to think about it, mosquitoes become most active at dusk, about the same time martins and other birds go to bed. Since martins eat only insects, they have to migrate to continually have a supply of food. Their range is throughout most of the Eastern U.S. and Canada with some migration up the west coast of the U.S. Around the end of July, after the young have fledged and are capable of taking care of themselves, they can be seen congregating into large flocks of thousands of birds, preparing themselves for the long migration south. Each year wave after wave of martins make the trek from North America south to Brazil and surrounding areas in South America. They make the trip either via Central America or down the Florida peninsula, through the Florida Keys and Bahamas and across the Gulf of Mexico to South America. Martins are good fliers, and under normal circumstances the trip is not too hazardous, but a large storm in the Gulf of Mexico at the wrong time can devastate a migrating flock. Martins are a protected species under the Federal Migratory Bird-Treaty Act, thus it is illegal to harm the birds, their nests or any other part of their habitat. It is also illegal to trap or possess these birds without proper permits from the U.S. Fish and Wildlife Service. In the following map, the shaded area indicates the overall range of the Purple Martin, and the cross lines indicate the approximate arrival of the scouts in a given area. These dates are only approximate and may vary by as much as a couple of weeks either way. 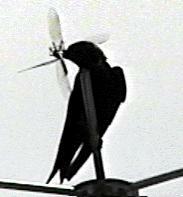 There is no real benefit to erecting and maintaining a purple martin site other than the shear enjoyment of it. They are a delightful bird to have around, and are actually friendly towards man, allowing the inspection of their nests without any apparent negative effects to the birds. When the nests are put back up in place after inspection, the parent birds soon return to their daily activities as if nothing ever happened. Sitting back and watching their antics throughout the day is a pleasant and relaxing past time. In fact, in time, you'll catch yourself spending more and more time watching and enjoying them.